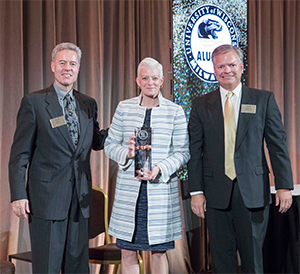 At the 2018 University of Wisconsin-Milwaukee Alumni Association awards, Baird received the Corporate Partner Award, which recognizes corporations or non-profit organizations that have a significant impact on the campus and/or on the lives of alumni and students by assisting in the advancement, growth and/or development of UWM. Edgar Sturkey, Vice President and Portfolio Management Operations Supervisor with Baird Equity Asset Management, also received a UWM Alumni Association Graduate of the Last Decade award for his ongoing involvement and commitment to UWM. More than 200 UWM alumni are currently employed at Baird, including several dozen managing directors and directors. UWM students represent nearly a quarter of Baird’s interns, and roughly a third of these interns are hired on full time. Baird leaders volunteer on the Lubar School of Business’s Investment Management Certificate Program Advisory Council, Business Advisory Council and the Baird Mentoring Circles Program. In 2016, Baird associates gave $1 million of working capital for students to practice managing portfolios. Baird also has a strong Panthers@Work alumni group and regularly participates in the Panther Prowl 5K Run/Walk, helping to raise money for UWM student scholarships. To learn more, watch the video below about Baird’s partnership with UWM.